Spyhopping is one of the behavioral traits performed by an Orca Whale off the coast of Northern Vancouver Island in British Columbia, Canada. A spyhopping Orca whale is a fairly common sight seen by the Northern Resident Killer Whales in the waters off Northern Vancouver Island in British Columbia, Canada. 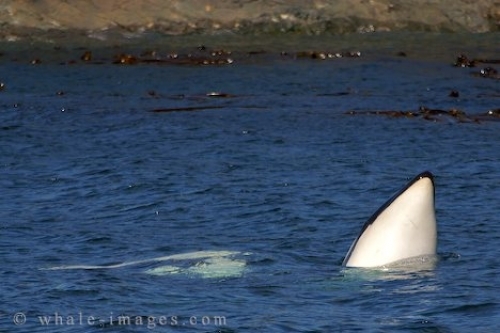 As one Orca pokes his head out of the water to check out the scenery, the white and black colors of another whale are spotted underneath the surface. Spyhopping is an act of coming out of the water vertically and staying above the surface momentarily in the same way a human treads water. An extremely powerful Orca can be spyhopping for longer periods of time and get as much as half of its body above the surface of the water. As far as humans have witnessed, it seems that an Orca whale performs his spyhopping traits to examine its surroundings above the surface. If an Orca hears anything strange, they may spyhop to see what is approaching on the water's surface. It is believed that an Orca can see as well above the surface as it can below. There is nothing more beautiful than seeing an Orca whale spyhopping in its natural environment. On certain occasions on a whale watching excursion you may get lucky enough to see two or three Orca whales spyhopping in unison.